WSLS 10 News: "New tourist train excursion could be coming to Roanoke"
“This is a donation that we have hoped for, for quite a long time,” said Fran Ferguson, Director of Development at VMT. Ferguson says, they’ve been working on securing the donation of the Belt Line rails, and the money to launch the excursion for years. But, it’s not a done deal yet. Edit: I see now that Trains Newswire declared it as a done deal one day ago. I wonder if that announcement is maybe a bit premature. Don't know. I'll have to see if I can find this line on a map to see just where it goes, see if it includes, say, some trackage that would go past the station (now the O. Winston Link Museum). There was also a dumb joker making a comment at the end of the WSLS link asking if the proposed rail service, with a running time estimated of one hour, will have sleeping car service. Bah! 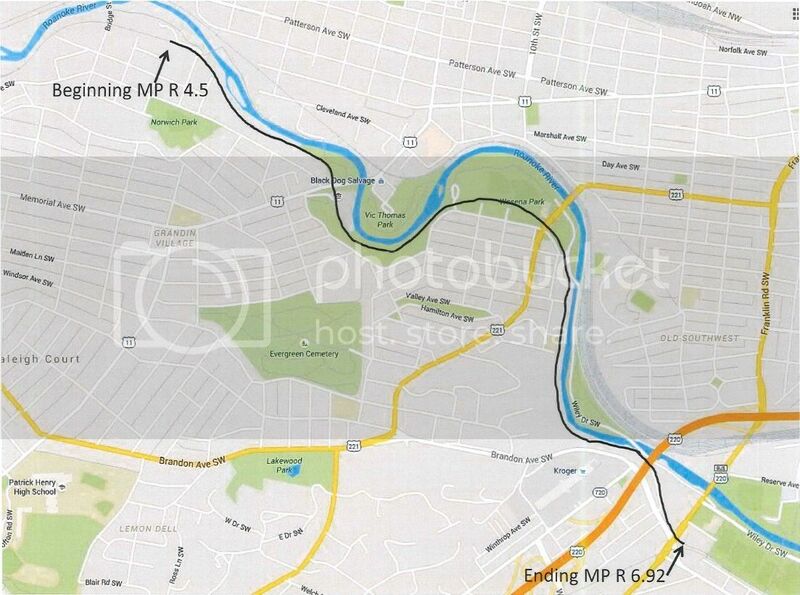 This linked map shows area and relation of belt line to greater downtown Roanoke and various museums...compare it to the picture provided below. This image shows the portion of the line to become the Roanoke & Southern Belt Line, covered by Donation. One Note is if you look in the upper right portion of the image provided you will see a section of rail yards and a street label for Norfolk Avenue SW, the stub tracks just above the "Norfolk Avenue SW" is the current Virginia Museum of Transportation. Look at map link provided via Google and you will see the relation of the belt line to the present Down Town Museum Location. The article in the original post states that 611 would not be able to run on this line. Why is that? The effective date of the notice is January 17th. While the donation may not have been finalized at that point, the facts that the museum has created a common carrier to acquire and operate the line and that this is being done as a transfer between carriers should preclude some of the shenanigans we so often see with third party Offers of Financial Assistance. I presume there are still a few businesses on it, NS may get trackage rights to operate it unless VMT can handle it. More than likely restore a small engine (make it steam) and a passenger car or two and you got something going. Sorta a short run but enough fun. Naw, 611 would not be right on it, but maybe enough excersize room. short of any hard curves. Did some viewing of the beltline on google maps. When you switch to satellite view you can see that the line needs significant work like reestablishing road crossings. By the time you return the track to operational condition, it'll be "new like". As for getting from the current VMT site to the beltline by rail you head east out of VMT and turn south at the Art Museum. That line runs along 220 to the Roanoke River and crosses it before turning West. The switch connecting to the belt line is just before Franklin Rd past River's edge Sports complex. A N&W 4-8-0 would be the perfect sized loco for the line. Appears that the trackage around Walker Foundry is completely buried or missing??? First, I want to thank Mr. Pullman for the map and link to look at where this line goes. It's amazing how much of the line isn't visible in satellite view due to the tree canopy. I hope those trees aren't growing up through the track! I have to say, it doesn't look like there is much in the way of freight shippers there now, though that doesn't mean some of the firms might not be interested in the future. I do not expect it would be anything really regular. It does look like what would have been a potential shipper is now a club called Wasena City Tap Room & Grill. There is also a building labelled The Green Goat Restaurant that looks like a former station. Some tickled brain cells here--is the the belt line originally on the city line of Roanoke that was built by the Virginian Railway? I concur, small steam, such as an N&W 4-8-0, the small G-class 2-8-0 that VTM has, or even Virginian No. 4 (ancient 0-8-0 also at VTM) would be appropriate regular power on this line. And then there is a Baldwin diesel from Chesapeake Western, but that might be asking a bit much! Oh meant to ask earlier. When in Google Satellite view, I noticed a former round house at Elmwood Park along the line parallel to 220. What RR did that belong to? First off I do not speak officially for or on behalf of the Virginia Museum of Transportation or the Roanoke Belt Line, I'm merely providing factual information that is publicly available. Provided is a make-shift Track Chart of the Roanoke Belt line made up of the two pages of the Norfolk Southern Virginia Div. Track chart that it can be found on. Since the line was split over two pages, I pieced together the two into one image. As you can see the "Donated" portion of the belt line is located between the two Red Arrows. Top R4-R5-R6 and so on is the line ID and Mile Post, in this case its the R-line and the miles post for the Donated portion of the Belt Line starts between R4 and runs "Track West" Really it's running East from left to right when only referencing the Belt Line. Next is the graphic representation of the Line its self, Heavy Arrows are switching leads beyond the scope of the track chart and sidings are shown at R3.9, R4.3 and R6.1. The only siding presently located on the donated section is at R6.1 which used to service the old Cold Storage Building that is now upscale condo's and restaurant, no industry here now. None of the crossings shown are signaled, only sign. No gates on any of them. 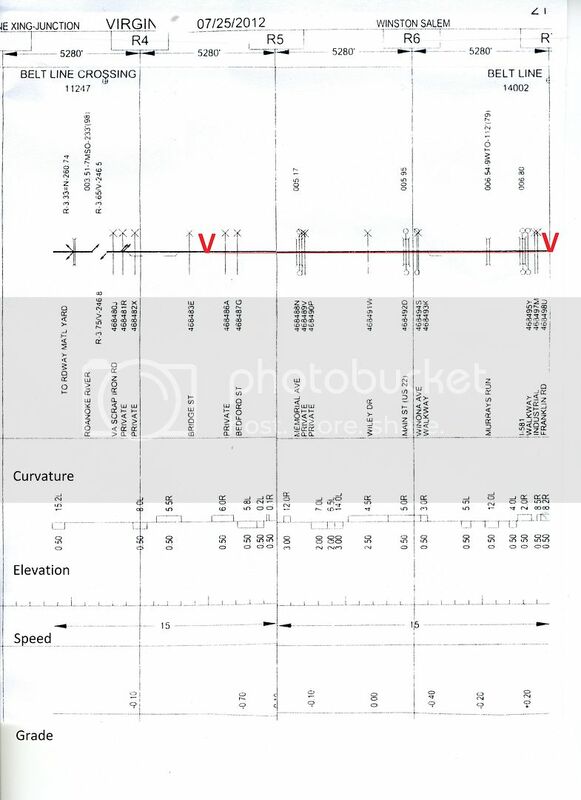 There are two water crossings to be mentioned and thats at R6.6 over Murrays run which is over a timber trestle in a 12degree curve to the left, the other bridge is another timber bridge at R6.95 just before Franklin Rd and it is roughly 18 to 20 feet long. There are no underpasses along the line, though there are three major overpasses at R5.2 (Memorial Ave), R5.9 (Main St) and R6.75 (Interstate I-581). Next after the graphic display of the line is Curvature. Curves of note on the line are the following, R5.1 (12.0 degree right hand curve), R5.45 (14.0 degree left hand curve) and R6.6 (12.0 degree left hand curve again on bridge). After the Curvature display is the Elevation of the line in relation to the curves. After the elevation is the Speed which was last listed at 15mph over the entire length of the line and then finally is the Grade display and as you can see is very minimal given it follows the natural flow of the Roanoke River just to the North of the line. As mentioned before the line needs to be cleared, and the various crossings will also be addressed with the appropriate parties involved. Yes Land has already been secured to support operations and three additional Heavy Weight Cars have been purchased to contribute as well. As for motive power that is still being addressed. But in the short term rebuilding the line would be priority one. Last edited by Mr.Pullman on Fri Jan 01, 2016 5:45 pm, edited 1 time in total.